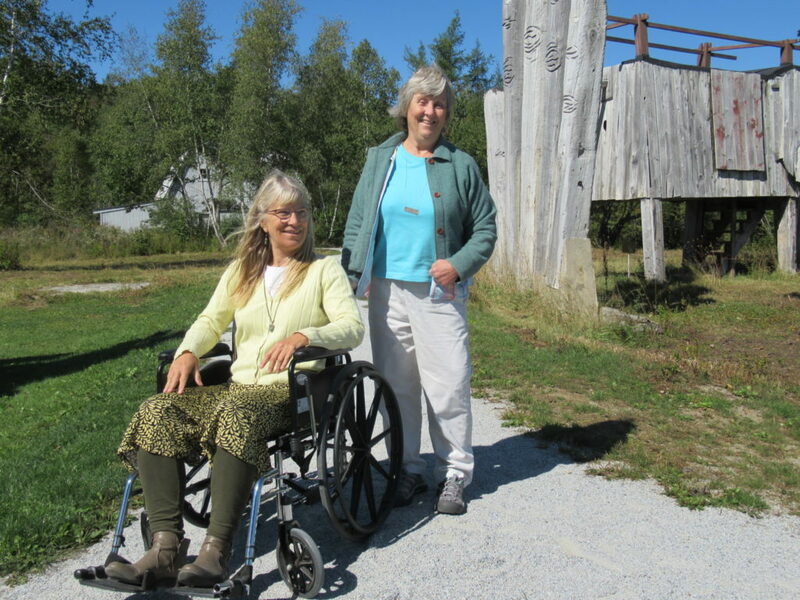 The ADA pathway at the Langlais Sculpture Preserve in Cushing is newly augmented by the long-term loan of a wheelchair from Carol Rohl. Having made her way around the sculpture path on a crisp fall morning, Carol was pleased to think that this wheelchair can help others have the same experience of seeing Langlais’ work in the natural setting where he created them. “I hope people will take advantage of this opportunity to experience nature and art, by way of this easily maneuverable ¼ mile pathway that leads through meadow and woodlands amidst these larger than life playful sculptures,” said Rohl. The Land Trust is extremely thankful to Carol Rohl for her generosity and vision to see the Preserve be truly accessible. The wheelchair will permanently reside at the Langlais Sculpture Preserve and will be available for people to use when at the property. The Land Trust encourages people to call ahead at the office in Rockland at 594-5166 if interested in using the chair. The outdoor sculpture preserve is open seven days/week and the buildings are opened three seasons on weekends, thanks to our Langlais stewards. Their schedule, which allows the buildings to be open, will resume in the Spring of 2019. In the meantime, the Land Trust will have the wheelchair available for all events hosted at the Langlais Preserve.